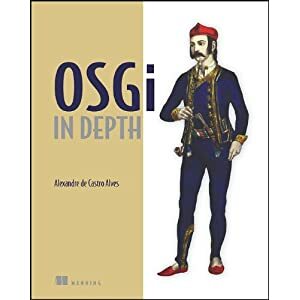 When I first came across OSGI In Depth (was originally called Enterprise OSGi In Action during its Manning draft stages) I had to ask myself whether the same publishing house could justify another book on OSGi when they had already published OSGi In Action a year or so before. Having now read both I have to say that there is a case for both, yes there is a degree of overlap – but that is necessary to set background. The In Depth book is very much geared up for architects and looks at the technology from a architecture and design consideration with some very honest insights and good practices. The In Action is better suited to developers that need to know about all the different interfaces. The two books are very complimentary, where to start obviously depends upon where you’re approaching OSGi from. In Depth can at times feel feel a little be discouraging read, but upon reflection what you’re reading is actually very honest worts and all set of insights. Lets be honest how many J2EE books go into the challenges, and headaches of getting entity EJBs to be highly performant, not to mention the deployment challenges that could be faced with versioning of the underlying database if your selling production solutions that should be easy to upgrade. When you get past this, there are some seriously valuable insights into possible dead ends that you could go down or catch you out later on if you don’t do that up front thinking about how you want to package, deploy and upgrade during the earlier phases of a development programme. The book illustrates the way to address a number of these, and provides a number of design patterns. The book does miss a trick of providing these patterns as an appendix where they can be easily referred to for reference only. Very good insight into the book. There has been a recent update, which includes a new JNDI, JMX, and ‘cloud’-related chapters. It would be nice to get your feedback from these chapters as well. Will be happy to check out the updates and reflect those into the review. I’ve started to read the new chapters, starting with OSGi in the cloud. A clear technical piece of writing, but would benefit from good practise / insights into dealing the constraints – for example as invocations have to be pass by value not reference some interfaces need to be implemented differently, this leaves the question of when do you design for pass by value vs by reference. In essence part of the ongoing design thinking when working with local and remote EJB interfaces. I do talk about some of the design constraints when dealing with remote services, and hence the ‘cloud’, in section 10.3. Perhaps you missed that as you started on 10.4, or do you mean something in addition? Eagerly waiting for more feedback.